It has to be winter break–the waves look fun, but the crowds are thick. Listening to others on the walk back in the dark, I’m not the only one feeling unfulfilled. In the winter, Trestles just isn’t the same. Work your way into the lineup and the stress starts to mount. The westies are pushing so much water they feel like boat wakes and are impossible to dominate. And, every wave has about ten guys scratching toward shore trying to keep up with its deep-water speed. Makes you want to give up. Then, you realize everybody else is going through the same frustration, but are in full denial. Here’s a photo of sunset on Monday night. Wish I had a real camera, not my crackberry. It’s taken from the north end of Garcialand. The crowd is split in two—some just north of the point and the rest in the bay–scavengers picking at the meat of the leftover rights. Not many lefts today. Enough whining–all this to say I can’t wait ’til the southern hemisphere kicks in again so I can try out my new board in real waves. And, de-stress. ps–yes, I said new board. Yes–another day at the computer instead of in the water. See, it was a “Victory at Sea” day in OC. Have you ever wondered where that description of surfing conditions actually came from? Well, here it is. Back in World War II, the Navy used a series of newsreels to explain to the American people how the Navy operates. Somewhere along the line, probably before the 1960’s one of our surfing brethren must have stumbled out of the theatre, checked out the latest conditions and made the connection. Thanks to him, we have our own shorthand for “crappy, blown out” conditions. Check out the first installment in the series by viewing the video below. What else do you have to do today? 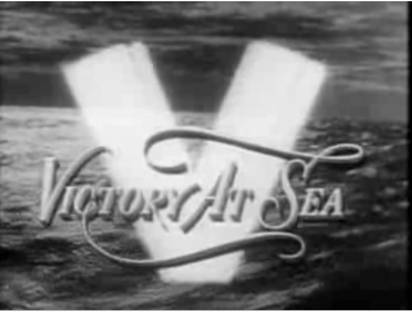 It’s a victory at sea day. So, what is the difference between snowboarding in the national forest and surfing in the US territorial waters? 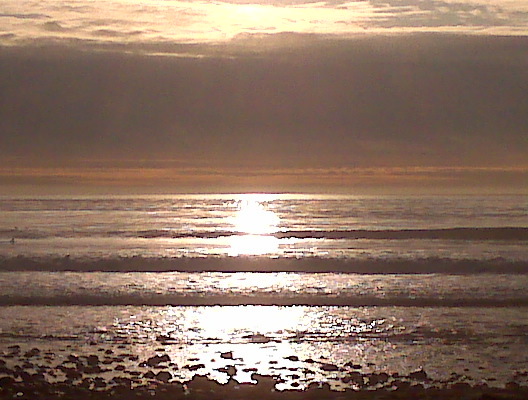 Hopefully, as the state and federal deficits grow, the men in grey suits don’t come to Trestles with a ticket machine. I guess the deal is that snowboarders can technically ride at any ski resort they choose; they just can’t use the lifts without paying. Hopefully, nobody comes up with some sort of fixed-pole lift system for Trestles that would increase crowd capacity by towing surfers out to the line up so as not to allow any waves to go unridden. I can just hear the entrepreneurs selling that in DC. 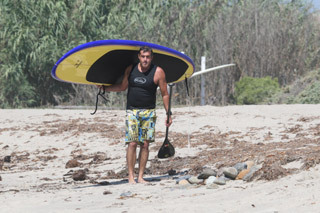 So, what’s wrong with Stand Up Paddle (SUP) boards? Who knows? Surfers are at the same time the most tolerant of our breed and the most intolerant of our breed. When it comes to accepting people the way they are, surfers take the lead, because surfers want to be left alone to be themselves. On the other hand, when a new piece of equipment or trend shows up at the beach, there are always a lot of naysaying foam jockeys ready to tear it down. I’m not sure where I fit in when it comes to SUP’s, but let me explain. I feel threatened by SUP’s and I’m not sure why. Could be the price tag. I’m afraid I might get hooked and have to invest a few thousand on stuff that takes up more garage space. If I don’t spend the money, am I missing out? Will I feel like I’ve been “one-upped” once again by the guy that is going to brag about his SUP in the lineup? Could be the potential for conflict in the water. Will that SUP lurking outside the lineup suddenly flash by me from a deeper position? I hate to think what would happen to my board, let alone me, if I don’t move out of the way fast enough. What will that do to the pecking order in the water? It seems like one more gimmick used to trump the rest of the crowd. Could be the radical change it could bring to surfing as it’s currently known. Reading through my old buddy, Brian Hovnanian’s, website (www.hoviesup.com), it sounds like SUP surfing is actually a more pure form of soul surfing, taking us back to earlier days in Hawaii. And, it also sounds like the real growth for SUP’s is for inland rivers and lakes, similar to how windsurfing grew in the 80’s. Look how change over the last 50 years has improved the experience for all of us already. I’m seen as a change agent at work, why not in the water? So, with all this revealed, I know there is really nothing to dislike about SUP boards. Not everybody is going to jump in; and if they do, all the better. Let’s welcome them into the fold. We’ll need to figure out a good way to drag them down the bike trail. Can we just come up with a better name for them? SUPer boards? Standups? Megaboards? Let’s all stand up for SUP’s! Join us as we take a quick ride down the bike path from the parking lot to the world famous Trestles surfing beach. Of course if the toll road had been built, this trail probably wouldn’t exist anymore. Enjoy the ride. Watch out for pedestrians!